Since the founding of ACE in 2006, we have donated $245,092.00 to support non-profit groups working in Africa and Indonesia trying to save great apes and their habitats. You can make a difference! We will be hosting events throughtout the year to benefit organizations that work to save the great apes. Join us at these events. 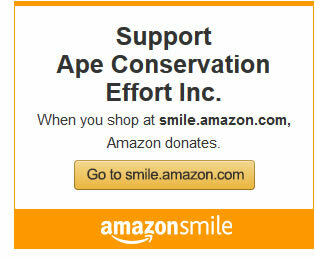 Support Ape Conservation Effort when you search the Web or shop online with GoodSearch. If you would like to help us save the great apes, then it's never been easier than now. By using Goodshop to save money with deals like 1800Flowers coupons, Jared discounts, and savings at Orbitz, you can help our conservation efforts at the same time. To start raising money for our cause with each purchase you make, signup for free and choose Ape Conservation Effort as your favorite cause.